Market Manager is a new utility found under the Tools menu after installing the addin from the Extensions section of wealth-lab.com. 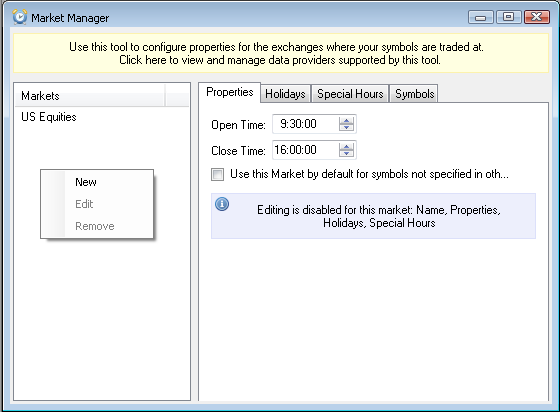 This utility allows Wealth-Lab Developer 6 users to configure properties for the exchanges where their symbols are traded at. To better understand what the tool is about, think of the Market Manager as the middleman between a data provider and Wealth-Lab. The data returned by your data vendor are stored by the data provider, and when you turn on Market Manager support for it, the data is preprocessed on-the-fly before handing it back to Wealth-Lab. You want to hide premarket and/or aftermarket data. Your data contains bars that should not normally be there. The need to define market groups and configure their properties. The yellow ribbon at the top of the MM's pane is clickable. Clicking this area will invoke a dialog that lists installed data providers compatible with the Market Manager. Not all providers are instantly supported – currently it's ASCII, Database, DDE, Dukascopy, Finam, Forexite, Google, IQFeed, MetaTrader, Morningstar, QuoteMedia, Stooq and Yahoo but more are expected to have Market Manager support. Checking/unchecking the box will globally enable or disable the effect of Market Manager for this provider. You can use the Market Manager to filter both static and streaming data outside market hours. Configuring market hours and filtering data outside market hours is helpful, for example, when you don't want to take the associated risks of lower liquidity, wider spreads and higher volatility. In this case, it makes sense to ignore the premarket and aftermarket activity or the extended trading session in futures. The ability to specify "Open time" and "Close time" serves the same purpose and is one of the Market Manager's highlights. 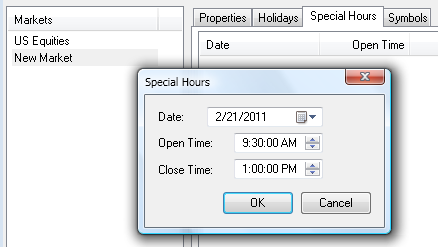 Specifying an Open Time and/or Close Time different from 0:00 for a market group will automatically filter the data for all the symbols it includes. Wealth-Lab will hide any data outside of the market hours indicated. (You may need to refresh the static chart after making changes to the option). For example, if you're charting the Xetra stock market, create a new preset and specify the open and close times in Central European Standard Time. As you may understand, disabling the market hours filter is simply a matter of setting back both the open and close times to 0:00. Checking the option "Use this Market by default for symbols not present in other markets" highlights its entry in the list, and consequently Wealth-Lab will treat all new, unspecified symbols as if they belong to this exchange. The purpose of this tab is self-explanatory: to exclude days of the week from the charts such as weekends. 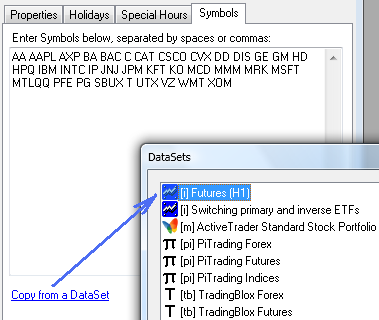 In fact, if your data happen to contain a day that should not normally be there, right-click in the list (right pane) and select New to define an unwanted bar, and the whole trading day will be gone off your charts and strategies. If you change your mind, you have the option to Edit a holiday or Remove it completely. This filter will mainly help you handle shortened trading sessions (typically holidays) - for example, if the market open and/or close time are not standard. When you don't want to deal with premarket and aftermarket trades for a partial day in your intraday data – like the one which starts normally at 9:30 AM but ends at 1:00 PM – right click in the pane, choose New and this will exclude the data that falls out. As with the other MM's panes, to edit a partial day select Edit and to delete it, choose Remove. Last but truly not least, is being able to define a particular symbol universe. Type in, paste here or delete symbols (separated with spaces) just as if you were dealing with a DataSet. Although you can type the needed symbols manually, clicking on "Copy from a DataSet" is a real time saver. This will pre-fill the list with symbol names of a selected DataSet. Repeatedly clicking the option helps quickly build a market group that consists of multiple DataSets. If a duplicate symbol is found in another market group, Market Manager will prompt you to take action and resolve the conflict. After reviewing the list of conflicting symbols, choose Undo symbol change to roll back the latest change. Alternatively, you have the option to Remove duplicate symbols from the current market group or from any other groups. Completely: to disable Market Manager for a provider, click on the yellow ribbon and uncheck the provider. You can safely skip reading this section if your Market Manager experience is smooth and transparent. Bug: While Streaming is enabled for a symbol, moving it to a different market group in the Market Manager can potentially mix its streaming bars with other symbols' data. Limitation: Symbol names containing spaces (e.g. "Gazprom ao") are not supported. Limitation: Symbol names containing multiple dots (e.g. "MMA.AAPL.O") are not supported. 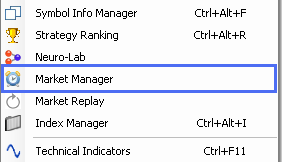 Filtering takes place regardless if the symbol was specified in the Symbol Info Manager or not. When filtering or converting the data, Мarket Manager will not aftect base Weekly, Monthly, Quarterly and Yearly scales. It's only applicable to Intraday and Daily scales. For Daily scale, only Holidays filter is in effect.